'Themselves Here Together' (2018), image courtesy of the artist. The installation at The Word, South Shields is a repeating sequence of projected images and accompanying soundtrack, a montage of voices speaking, whispering or singing disjointed words and phrases. The recording was produced by vocalist musician Sarah Grundy then edited and layered by Helen Shaddock to accompany her projected images and animations. The words were provided by Shaddock after spending time with groups such as Unusual Experiences at Broadacre House. Here the artist spent time with people who have experienced auditory or visual hallucinations, with a desire to express something of that experience to her audience. The installation certainly conveys a sense of disorientation, with images flashing up at different points around the room, using all the walls in the space. The viewer is forced to turn this way and that, trying to keep up but always missing something. Frantic, aggressive lines like scratches or scars criss-cross in fast succession as the voices build to a chaotic discordant frenzy. Moments of relief come as softer images take over, pastel coloured discs like microscope slides which linger a little longer. Shaddock’s research revealed that often those who hear internal voices find the dialogue at times reassuring and comforting, whilst at others it can be disturbing and destructive. These contrasting effects are expressed through the use of pace, volume, colour and mark-making in this piece. The barrage of light, movement and sound, in which it is impossible to distinguish more than the occasional word (‘lose ourselves without… forever… everything… everyone…’) give the viewer an experience of sensory overload, struggling to know what to focus on or where to look. In the more harmonious moments the voices come together like a monastic chant or plainsong which has a strangely soothing influence. 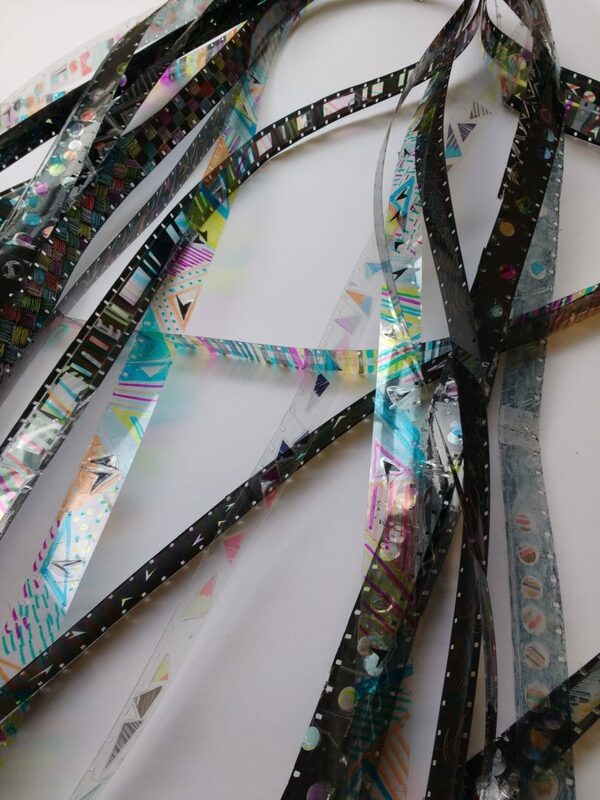 16mm film used in ‘Themselves Here Together’ (2018), image courtesy of the artist. Shaddock is keen to maintain a hands-on approach to creating her artwork, despite it being presented ultimately in digital format. 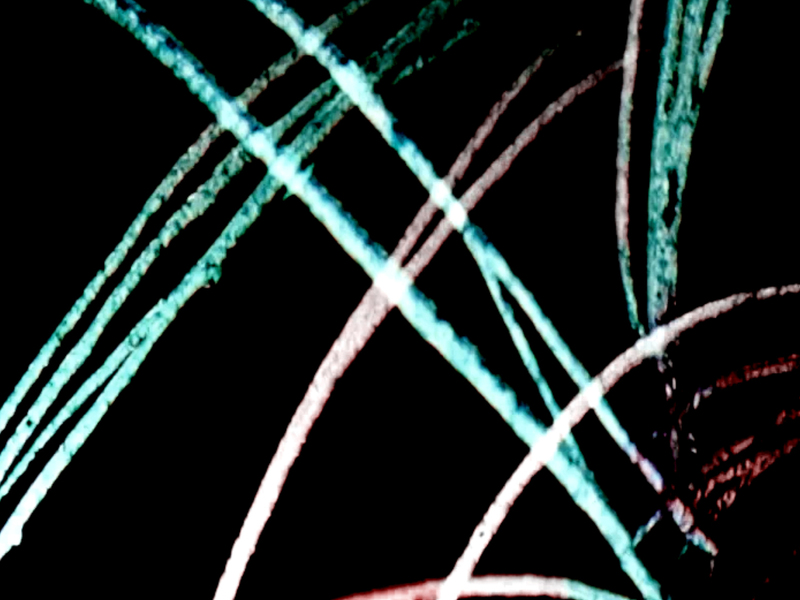 The images and animations were created by drawing, scratching or collaging directly onto 16mm film, with the later conversion from analogue to digital producing a sense of detachment, of being ‘one step removed from reality’, a state perceived by many of those who participated in Shaddock’s research. The artist’s method here makes visible the human involvement in the creative process, with the vastly magnified images refusing to hide the flecks and squiggles of imperfection. Themselves Here Together is the result of Arts Council England funding and is on display in the StoryWorld room on level 2 of The Word, South Shields, until Thursday 21 June 2018. Opening times are Monday to Thursday: 4–6.30pm and Sundays: 1–4pm. More about Helen Shaddock’s work and research can be found on her website. Sarah Davies is an artist and writer based in Newcastle upon Tyne.